Robert Earl Wilson Jr. has claimed of serving in the United States Marine Corps, retiring as a Master Sergeant (E-8) after a 22-year career. He is a Small Unit Tactical Training instructor in Georgia who often makes training videos. Wilson often displays the following photo as testament to his younger days as a Marine. 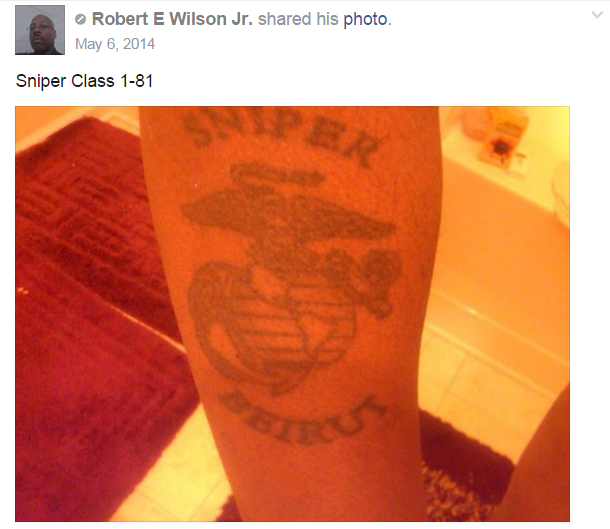 Wilson claims to have been a 0321 Recon Marine as well as a 8541 Scout Sniper, as evidenced by the tattoo he proudly displays. 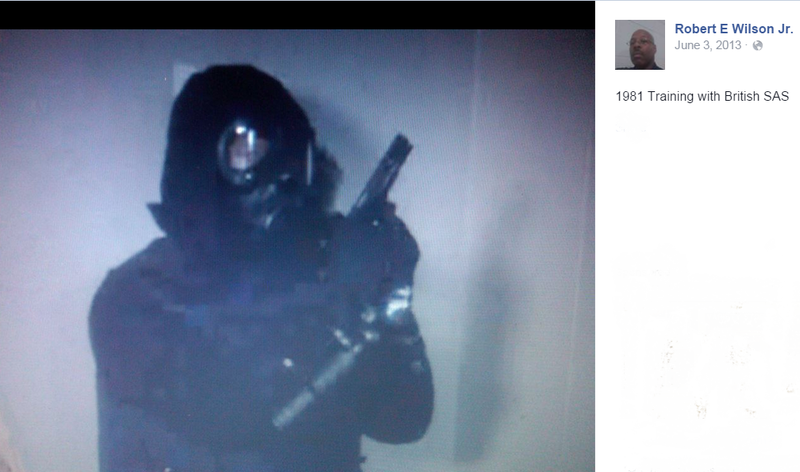 Wilson claimed that he trained with British SAS in 1981. The assumption is that it’s him in the photo by nature of the caption that accompanies the post. Wilson claims he was attached with Fox 2/8 while in Beirut, Lebanon in 1982, and with 22nd MAU while in Grenada. Wilson says he was wounded in Grenada so missed the second trip into Beirut, since the rest of 22nd MAU went ahead. 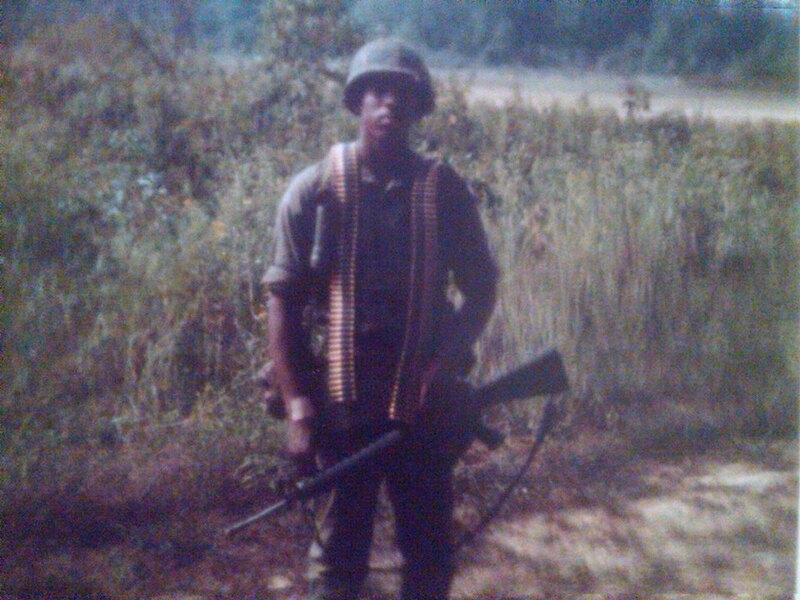 Served from 1979-2001 and participated in Operation Desert Storm with 1st Battalion / 9th Marines. Four (4) Freedom of Information Act requests were filed on Wilson. Upon return of the first one, it seemed quite unbelievable that they could not locate any record on Wilson. After all, he seemed to walk the walk and talk the talk. He even had a convincing photo of someone that appears to be him in his younger days. 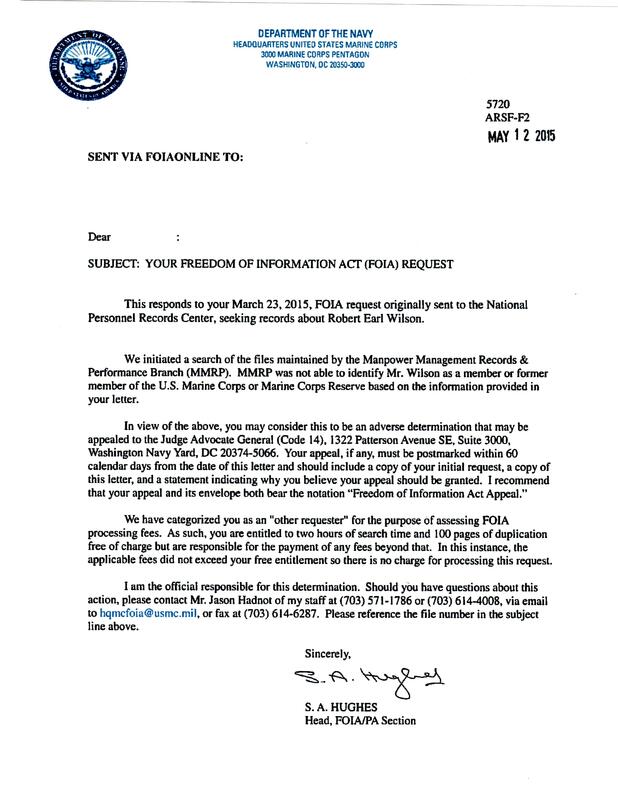 The second FOIA request came back from the USMC saying they have no record of him. 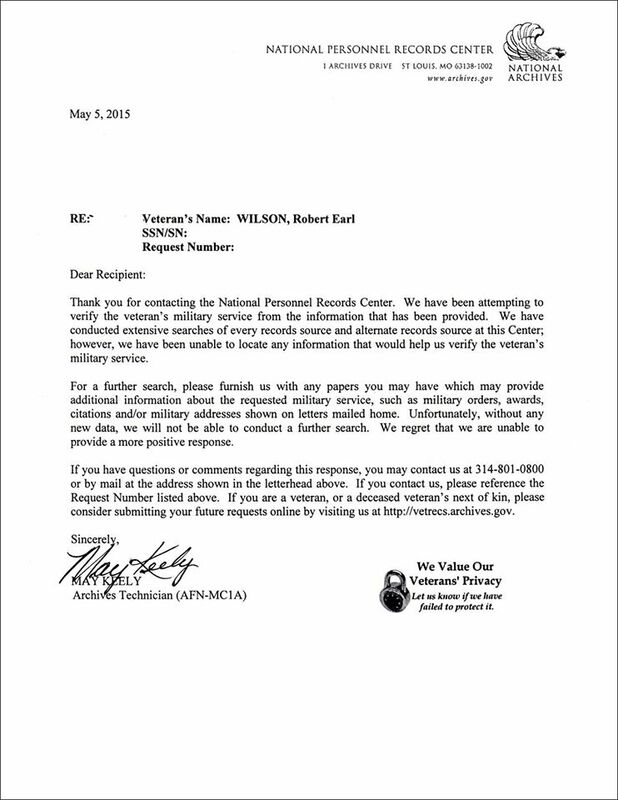 There was an additional FOIA for any Army service that also could not find any records on Wilson. We are still waiting for US Navy FOIA results as he may have been a SeaBee or Corpsman, but already his claim of being in the USMC is why you are reading about him here and now. Wilson’s official records do not support such a claim, let alone Recon, Scout Sniper, Beirut, Grenada and being wounded. Wouldn’t having a weapon while training others be in violation of something? Robert Earl Wilson Jr. was not listed the STA 2/8 rosters, even as cross assigned to Fox Company 2/8. He was also not on a list of Grenada casualties. Always got to be RECON. Always got to be a sniper. Never claim to be a POG/POUGE. Right. 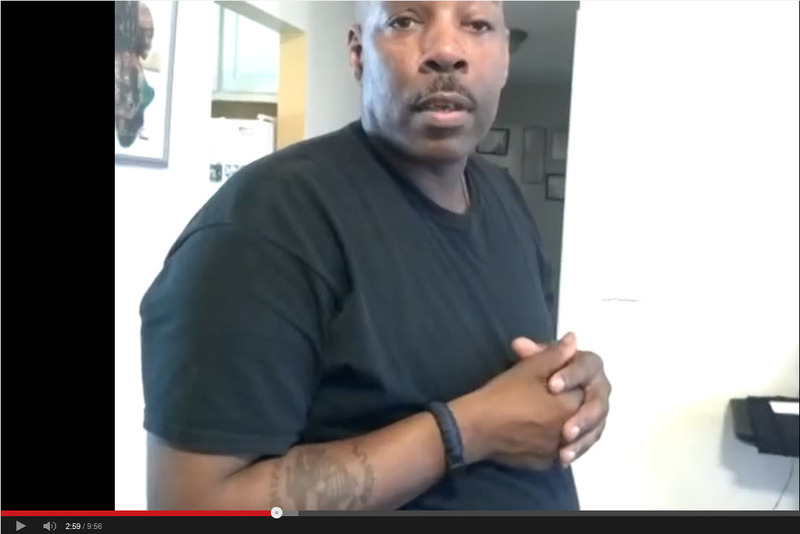 Looks like he can “talk the talk” but…. never “walked the walk”. Ha, Please tell me more about being in Desert Storm with 1/9,,, I was in the BLT as part of the Arty Battery, we didn’t even get to the gulf until June/July of 91!!. Still we were considered part of DS, but you were stretching it… Funny you didnt mention being part of Fiery Vigil. 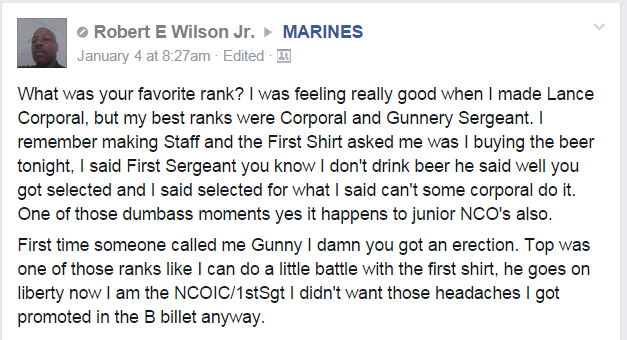 Also what Infantry SNCO doesnt mention 0369 asa on of his MOS’s? Another wannabe. Turd needs flushing. 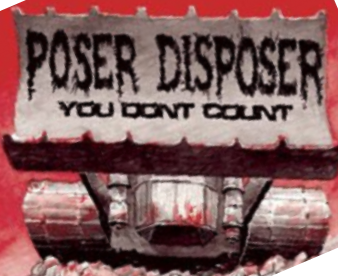 I do not know why these Posers want to use Recon, or any other Special Operation Forces who served in any Combat or Hazardous Areas. If they served, why don’t they tell the truth about the MOS they had instead of lying about it.